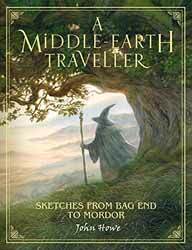 A Middle-Earth Traveller: Sketches from Bag End to Mordor (2018. 192 pages) is a book of Howe’s Illustrations dealing exclusively with Tolkien’s world. This is not strictly speaking a set of illustrations from the films, although many of the images will be familiar. Howe has taken a traveller's perspective of the world, as if he had gone on one long extended walking holiday. The sketches detail many aspects of the world and there is some attempt to present them in a way they would be geographically encountered. On top of that there are also sketches which depict historical locations and events, other pages are devoted to objects such as musical instruments and window designs. The hardback book measures in at 19.5 x 2 x 25.2 cm, so not quite a coffee table book, but a good size for a sketch book. The illustrations cover the majority of the space available on the high quality paper pages. Many have a small, barely intrusive, section of text placing the sketch into some form of context and are generally written as if the people and events depicted are real. The vast majority of the illustrations are pencils sketches. There are a number of coloured panels, but oddly enough these do not have the same feeling of intimacy that comes from seeing the artists’ individual pencil strokes. Overall, it’s a lovely book, something that you could spend many hours just pondering over, from the roads we have travelled together to the roads less taken, Howe’s imagination continues to bring Middle-Earth to life.